The 4-barrelled 1 inch Nordenfelt machine gun was a principal anti-torpedo boat gun purchased by the Royal Navy in the period 1870 - 1885. It was light enough to be mounted high up in the fighting tops of large ships, where it would have an unrestricted arc of fire, and from where the small torpedo boats could best be seen. This section looks at the how the gun worked, showing the operation of Nordenfelt's First System. As an anti-torpedo boat gun, the gun was capable of firing 120 shots per minute but in practice at sea only about 20 aimed shots per minute. The solid bullet fired was capable of penetrating a series of 4 steel plates each 3/16" thick from a range of 300 yards, showing it had a good chance of reaching and damaging the boiler of an attacking torpedo boat. 1" steel shot penetrated 1" of steel at 200 yards (St Petersburg trial 1880). the Gunnery Manual of 1885[N1] reported that the torpedo boats being constructed at the time would be penetrated at all ranges up to 1,500 yards, whether broadside or end on. The Gun consists of a rectangular framework of wrought iron, the sides of which are connected by three cross-pieces or transoms. The four barrels are placed side by side in the frame, their muzzle ends passing through the front cross-piece, while the breech ends are screwed into the centre cross-piece. A cover, hinged at the rear, supports the ammunition hopper, and is released by a spring lever fitted to the centre cross-piece. To the rear of the centre cross-piece is the action block, which is capable of movement backwards and forwards. In the front of the action block are four breech plugs, corresponding to the barrels. These are of steel pierced with channels in which firing pins move freely, and are furnished with extractors at the top. Behind each firing pin is a hammer (coloured red in the illustrations) with a projecting tenon and behind the hammer is a strong spiral spring. 2. A director or action plate which is a cam secured to the action block and having a slot into which fits a roller working on a stud on the action lever. A portion of this slot is the arc of a circle, concentric with that described by the action lever, the remainder is straight so that as the action lever moves from the right to the left the action block advances and retreats. 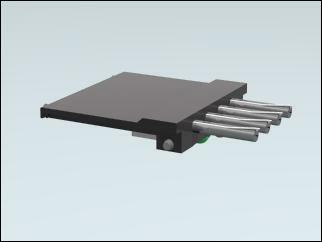 The cartridge carrier is a cast-iron plate, having four longitudinal holes for the cartridge cases to drop through when extracted, and a similar number of strips on which to carry the cartridges when loading. It is capable of a slight lateral motion, which is given by the lever (shown in blue). The sides of the troughs into which the shells fall has a ridge on each of the sides so that the diameter of the shell casing head is greater than the gap between the ridges. As the shell is supported at the front by a solid casting, the shell cannot fall through the cartridge carrier. The ridge stops a short distance from the rear of the carrier, so that when the head of a cartridge case being extracted passes beyond the ridge, it is no longer supported, and falls to the deck below. The trigger comb is a plate that is secured to the rear cross piece and is capable of transverse movement. It has four teeth bevelled on the forward side. A spring fastened to the rear cross-piece presses the trigger comb against the left side of the frame. The whole mechanism is set in motion by the hand lever which extends on the right side of the frame. The sights shown represent a tangent sight which would be graduated as far as 1,900 yards and is fitted with a deflection leaf by which 1° 30' deflection can be obtained either right or left. This deflection leaf is moved by a horizontal screw fitted with a milled head. Sights are fitted on both the left and right sides of the gun. The action of the mechanism is as follows, supposing the discharge to have been completed, the block closing the breech end of the barrels, and still secured in its place by the two locking bolts. 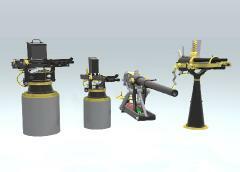 The images referenced in the text below have rollovers to illustrate a part of the operation of the gun's mechanism. 1. 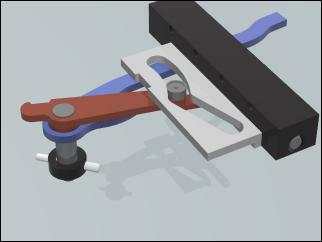 The hand lever begins to move to the rear, the friction roller traverses the curved part of the action plate, and the action block remains stationary. 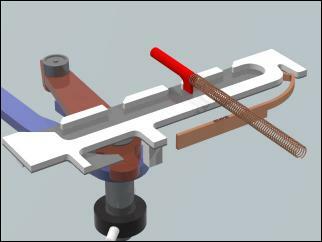 The heel of the action lever (red) releases the trigger comb, allowing it to move to the left under the action of its spring. 2. 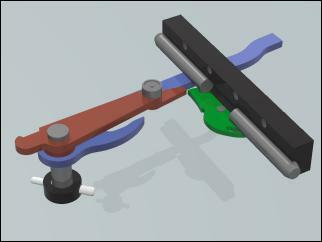 As the movement of the hand lever, which is connected to the action lever, continues, the toe of the action lever acts on the locking bolt plate (green) and withdraws the bolts, leaving the action plate free to move. 3. When the bolts are released, the friction roller on the action lever enters the straight portion of the slot in the action plate and as the hand lever is pulled further to the rear, the action plates begins to move back, drawing with it the breech plugs which extract the cartridge cases. 4. 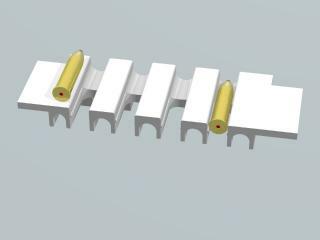 As the heads of the cartridge cases are pulled beyond the ridges in the cartridge carrier troughs, they are released to fall to the deck. 5. 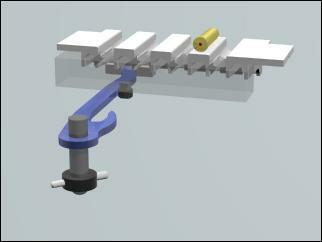 When the breech plugs are clear, the friction roller on the underside of the action block bears against the forked lever (blue) and so pushes the cartridge carrier to the left and the filled rounds fall into the trough. Its position is taken up by another round from the hopper. 6. As the action block moves to the most rearward position, the bevelled side of the tenons on the hammers press against the bevelled side of the teeth of the trigger comb, forcing it to the right. Once the tenons have passed the teeth, the trigger comb spring returns the comb to the left, thereby trapping the hammer tenons behind the teeth. The hand lever is now as far back as possible, and the action block in its furthest position from the barrels. 1. 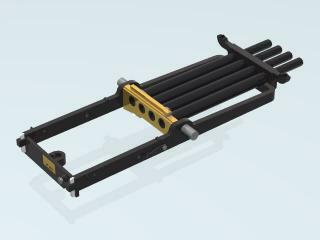 The friction roller on the action lever acts on the action plate and moves the action block towards the front. The friction roller on the underside of the block, which had engaged the forked (blue) lever now drives the lever to move the cartridge carrier to the right, thus placing the cartridges in line with the barrels. 2. 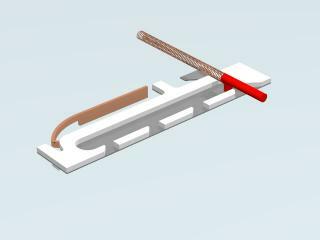 The action block advances to the front, and the spiral springs behind the hammers are compressed since the hammers are held back by the teeth of trigger comb. The breech plugs push the cartridges into the barrels. 3. When the cartridges are fully home the action block stops and the friction roller on the action lever enters the curved part of the slot on the action plate. The toe of the action lever causes the locking bolt plate to turn, thereby driving the locking bolts into the holes in the gun frame so that breech closing is now complete. 4. For the last 12 degrees of movement, the heel of the action lever bears on the trigger comb and moves it to the right. Each hammer is released in turn from the tooth that retains it, and the hammer is driven forwards by the spring, finally hitting the rear end of the firing pin which forces it forward to ignite the cartridge. In the Mark III gun illustrated, the second barrel from the right fires first, next the third barrel from the right, then the right-hand barrel and lastly the left-hand barrel. For training purposes, the gun crew would engage a drill stop, which is a catch that prevents the hand lever being moved fully to the rear. The hammers do not pass behind the teeth of the trigger comb and thus the gun is not full cocked because the springs are not compressed when the action block moves forward. A gun's crew consists of five men, who in the timeless fashion of gunnery drills are numbered 1 to 5. The gun captain is 1 and he aims the gun using the left-hand sights and the training and elevation handwheels. Number 2 is the firing number, and operates the hand lever. At the order to commence firing 2 draws the hand lever back to the full extent then forces it forward half way, and fires on the orders of 1 by pushing it forward to the full extent. This he repeats, firing each time by order of 1. When the hopper is empty, 3 replaces it with a filled one, and returns the empty hopper to 4 and 5, who refill it. Hoppers are filled from the base. There are four separate columns, and each column holds 10 cartridge. The filled weight of a hopper is 48 lbs (22 Kg). A slide is provided to retain the shells when the hopper is full, this slide engages on a lug on the cover of the Nordenfelt as the hopper is pushed finally into position, thereby releasing the shells into the slots in the cover. Note that if a jam occurs in one barrel and cannot be cleared immediately, the Nordenfelt can carry on firing, but only by replacing the hopper with one that has an empty column above the problem barrel. 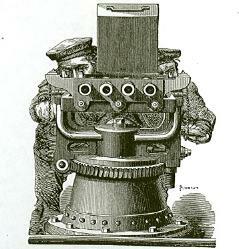 Contemporary drawings of the Nordenfelt often show that it was mounted low down, with the gun's crew crouching behind it. This, I believe is because as no other protection was available, the gun's crew wished to make as small a target as possible to enemy machine-gunners. In later years some Nordenfelts were provided with steel shields, but these restricted the visibility of the gunner and hindered his aiming at the fast moving torpedo boats. One final observation, frequently drawings of Nordenfelt gun crews show them armed with boarding cutlasses - boarding and repelling boarders was still a major tactic in the mid 1880s.